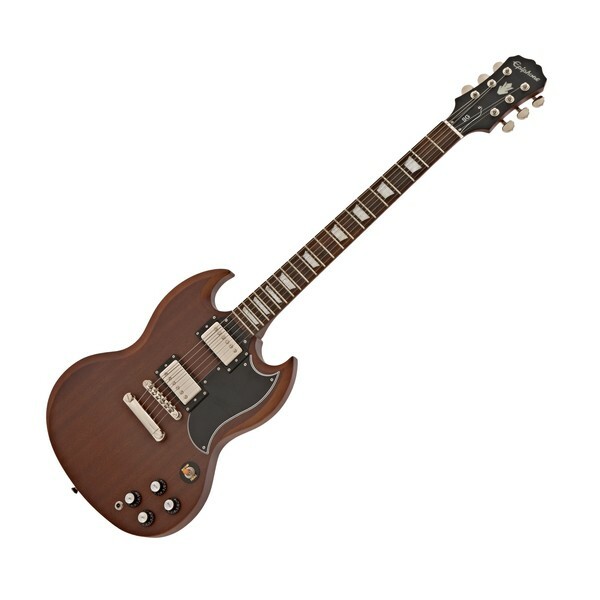 The Epiphone Vintage G-400 SG, Worn Brown is an affordable version of the iconic 1962 Gibson SG guitar, with the same classic twin horn cutaway and comfortable dimensions. 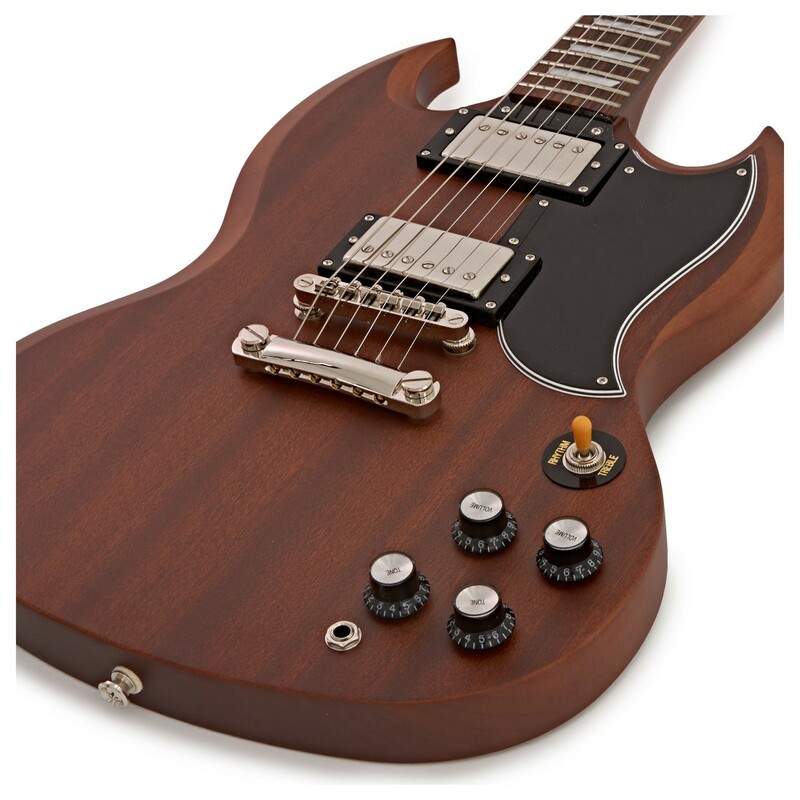 The G-400 SG features a solid mahogany body which yields exceptional resonance and warmth, and the mahogany neck complements the body with its rich tones. The beautifully carved body and double cutaway allows easier access to the higher frets, for a comfortable performance during gigs or studio sessions. The Epiphone Vintage G-400 is powered by a pair of Alnico Classic Humbuckers, with a Classic Plus at the bridge which together produce a powerful and wonderfully vintage sound. With quality hardware on-board, the G-400 SG provides reliable and stable tuning with a LockTone bridge and Stopbar, and Grover 14:1 tuners. 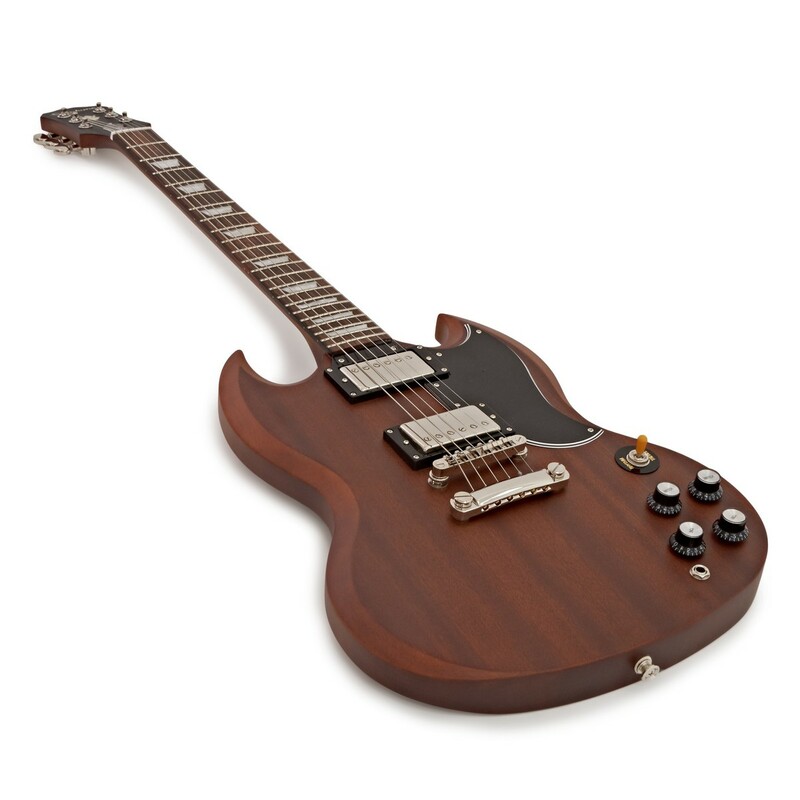 The Epiphone Vintage G-400 SG is finished in Worn Brown, with a faded satin finish and an 'aged' fingerboard for the ultimate vintage look and feel. Loaded with a pair of Open Alnico Classic Humbuckers, including a Classic Plus at the bridge, the Epiphone Vintage G-400 delivers a powerful yet balanced tone that is especially ideal for classic rock styles. With its vintage tonality, the G-400 SG yields that classic 60s sound, as well as a sonically pleasing tonal palette. The humbuckers deliver tight, sparkling highs and a deep, full-bodied low end, for a wonderfully versatile tone. The mahogany body gives the Vintage G-400 a warm and resonant tone with great sustain, as well as plenty of depth. Mahogany delivers good levels of grind and bite, which works exceptionally well with punchy rock music. 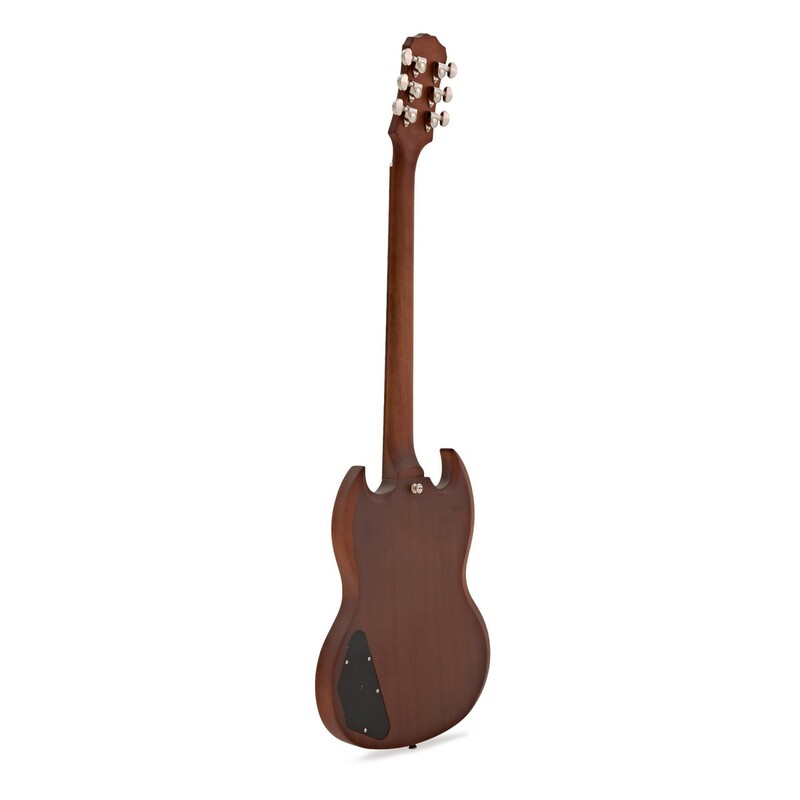 The mahogany body also provides durability, and a tone that will mature over the years for a long lasting investment. 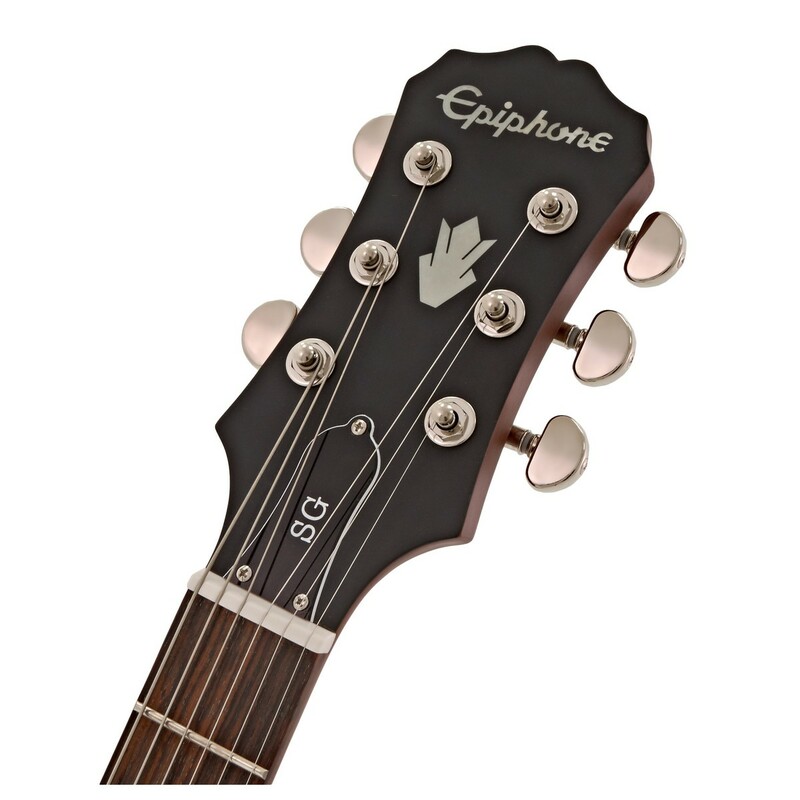 The Epiphone Vintage G-400 Guitar's neck is made from beautiful mahogany which is sturdy and provides good durability. Mahogany gives the guitar a richer focus, with warm and full undertones; and it is coupled with a rosewood fingerboard, ideal for creating articulate tones that are soft yet punchy. The Epiphone G-400 SG is equipped with rock solid hardware, consisting of a Locking Tune-O-Matic bridge and StopBar tailpiece which is fully adjustable. They are locked in place, which works to keep your tone reliably in tune, and improves sustain. There are also 14:1 Ratio Grover Tuners onboard for stability, and the metal 3-way toggle switch ensures years of sturdy use and performance. The SG series came onto the scene after the Les Pauls, from 1961 to 1968, with its 'Solid Guitar' body for enhanced power and sustain. The lightweight and incredible power of the SG, took the music world by storm and it has been used by many legendary rock players such as Eric Clapton, The Allman Brothers, Tony Lommi of Black Sabbath, and Pete Townshead of The Who.